What Is a Stewing Chicken? The poultry department can comprise a confusing array of legs, breasts and wings. You'll also find whole chickens labeled as fryers, broilers or stewers. While fryers and broilers are processed from younger birds, stewing chicken comes from older chickens, such as laying hens who have stopped producing eggs. Because of the age of the bird, stewing chicken meat can be tough unless cooked properly. If roasted or fried, the meat of a stewing chicken can turn out tough and dry. 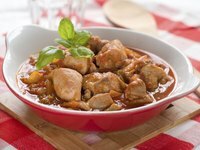 However, when cooked slowly in a soup or stew, the stringiness of the chicken breaks down, leaving meat that is tender and juicy. To prepare a soup, stew or chicken and dumplings with a stewing chicken, place the chicken with sliced carrots and celery, chopped onion and parsley in a large pot or Dutch oven. Add enough water to just cover the chicken. Bring the liquid to a boil, then reduce the heat to low and allow everything to cook for 2 hours, or until the center of the thickest portion of the breast is no longer pink. Betty Crocker's New Cookbook; Jean Kozar (editor), 1996. What Cuts of Beef Are Turned Into Stew Meat?